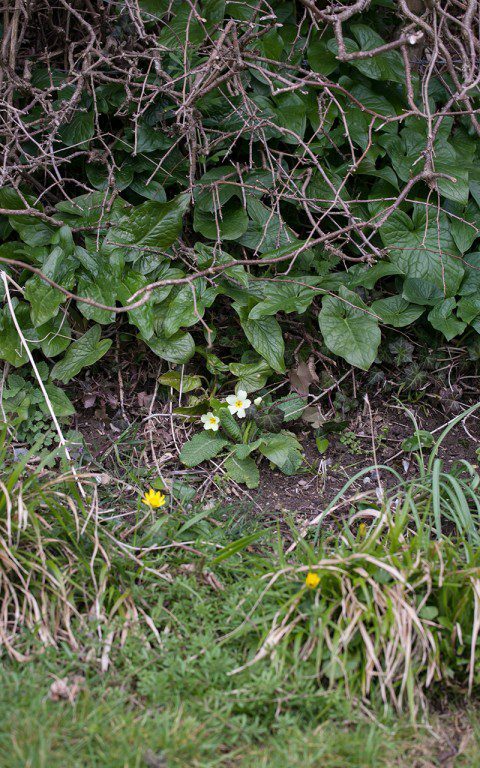 Primrose – Dig Delve – An online magazine about gardens, landscape, growing & making. Although the snow from last weekend has all but gone, the drifts that stubbornly mark the lee of the hedges on the coldest slopes are a reminder that winter’s grip is still apparent. 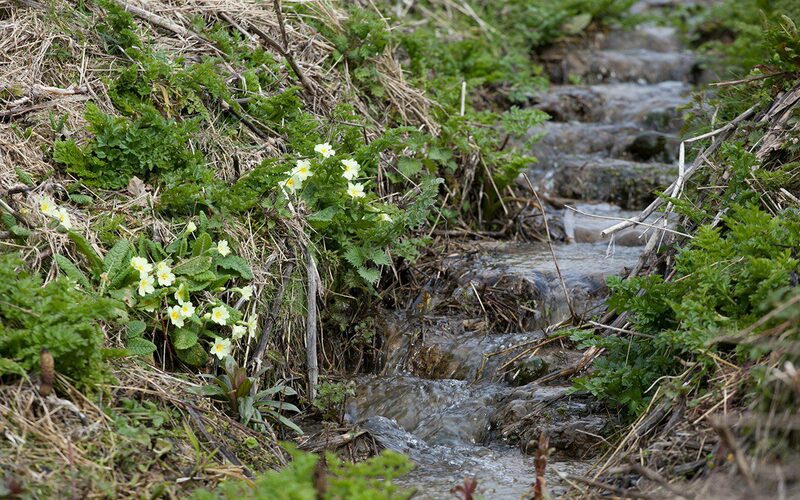 The primroses, however, have a schedule to keep and have responded with gentle defiance. 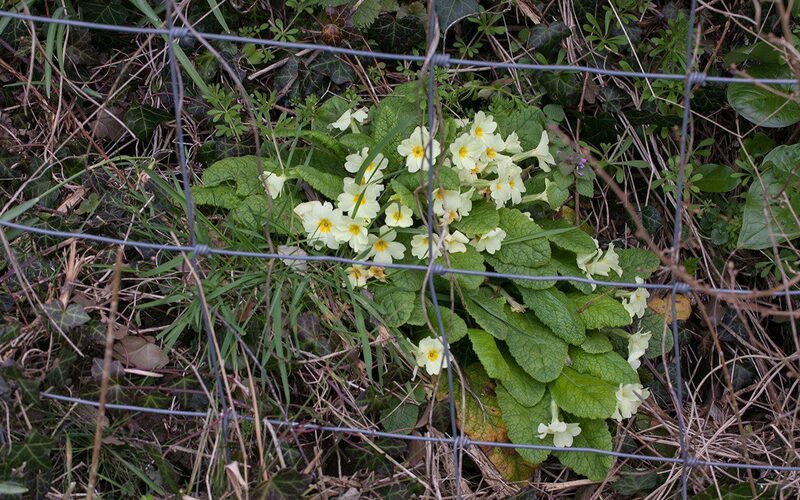 The first flowers were out just days after the first thaw to light the dark bases of the hedgerows, and now they are set to make this first official week of spring their own. Since arriving here, we have done our best to increase their domain. Although they stud the cool, steep banks of the lanes, they were all but absent on the land where the cattle had grazed them out. Save for the wet bank above the ditch where they were protected from the animals by a tangle of bramble. We noted that they appeared in this inaccessible crease with ragged robin, angelica and meadowsweet. Four years ago we fenced the ditch along its length to separate the grazing to either side and since then have done nothing more than strim the previous season’s growth in early January to keep the brambles at bay. The new regime has seen a slow but gentle shift in favour of increased diversity. 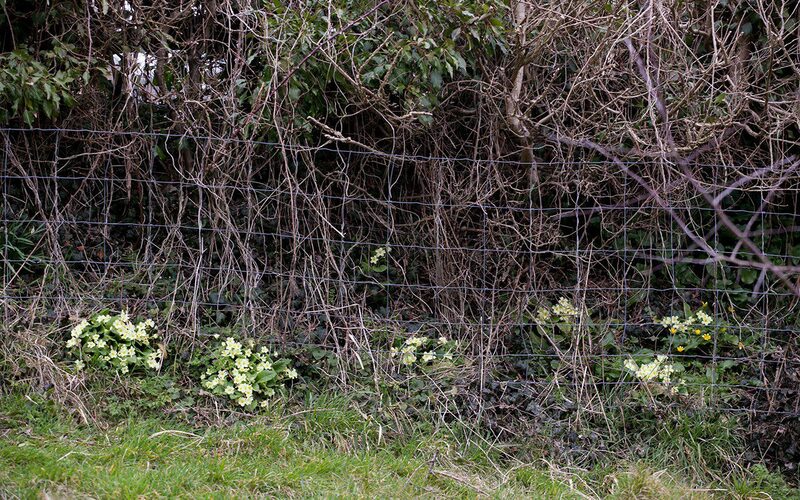 Though the brambles had protected them in the shade beneath their thorny cages, now that they have been given headroom the primroses have flourished. Their early start sees them coming to life ahead of their neighbours and, by the time they are plunged once more into the shade of summer growth, they have had the advantage. Four years on we can see them increasing. The mother colonies now strong, hearty and big enough to divide and distinct scatterings of younger plants that have taken in fits and starts where the conditions suit them. Each year, as soon as we see the flowers going over, we have made a point of dividing a number of the strongest plants. It is easy to tease them from their grip in the moist ground with a fork. However, I always put back a division in exactly the same place, figuring they have thrived in this spot and that it is a good one. A hearty clump will yield ten divisions with ease, and we replant them immediately where it feels like they might take. Though they like the summer shade, the best colonies are where they get the early sunshine, so we have followed their lead and found them homes with similar conditions. The divisions taken from the heavy wet ground of the ditch have been hugely adaptable. The first, now six years old and planted beneath a high, dry, south-facing hedgerow behind the house, have flourished with the summer shade of the hedge and cover of vegetation once the heat gets in the sun. 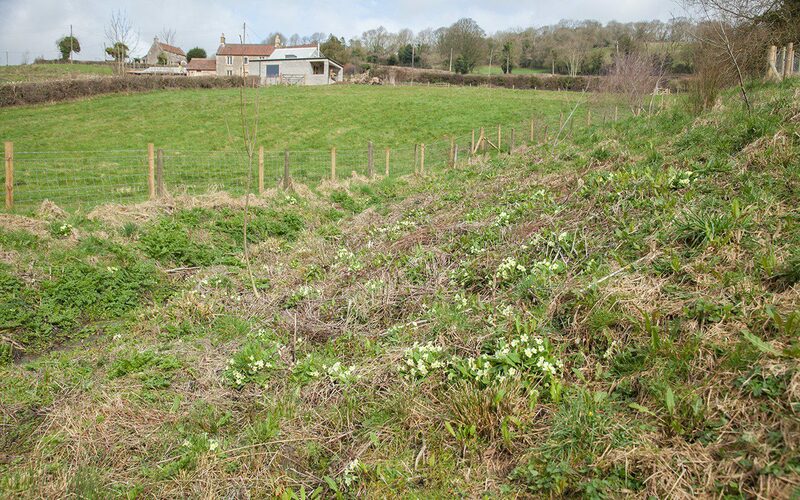 It is my ambition to stud all the hedgerows where we have now fenced them and they have protection from the sheep. Last year’s divisions, fifty plants worked into the base of the hedge above the garden, have all come back despite a dry spring. Their luminosity, pale and bright in the shadows, will be a good opening chorus in the new garden. The tubular flowers can only be pollinated by insects with a long proboscis, so they make good forage for the first bumblebees, moths and butterflies. 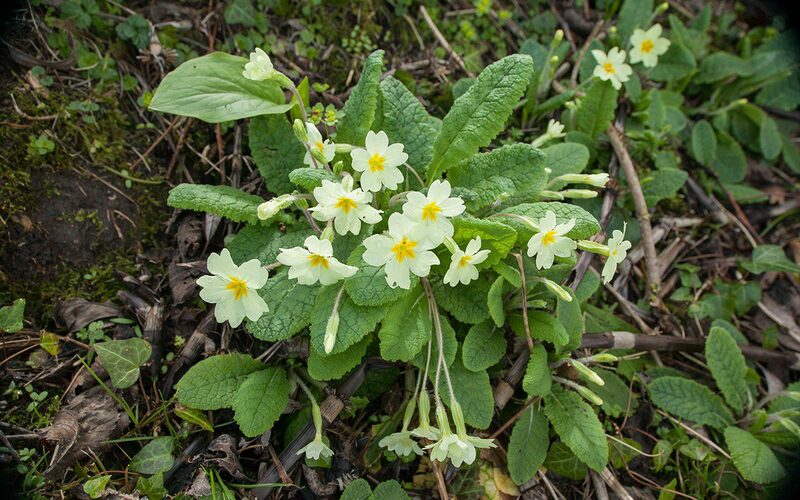 By the time the seed ripens in early summer, the primroses are usually buried beneath cow parsley and nettles, so harvesting is all too easily overlooked. However, last year I remembered and made a point of rootling amongst their leaves to find the ripened pods which are typically drawn back to the earth before dispersing. The seed, which is the size of a pinhead and easily managed, was sown immediately into cells of 50:50 loam and sharp grit to ensure good drainage. The trays were put in a shady corner in the nursery area up by the barns and the seedlings were up and germinating within a matter of weeks. As soon as the puckered first leaves gave away their identity, I remembered that it was a pod of primrose seed that had been my first sowing as a child. Though I cannot have been more than five, I can see the seedlings now, in a pool of dirt at the bottom of a yoghurt pot. 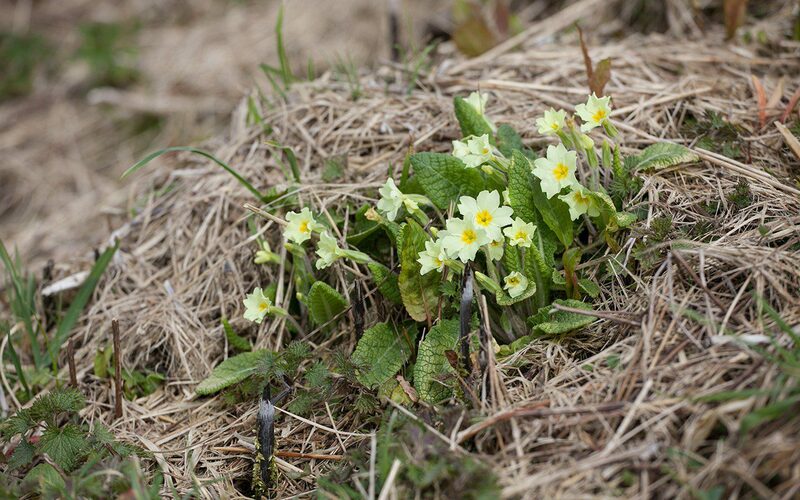 The excitement and the immediate recognition that, yes, these were definitely primroses, was just as exciting last summer as it was then. 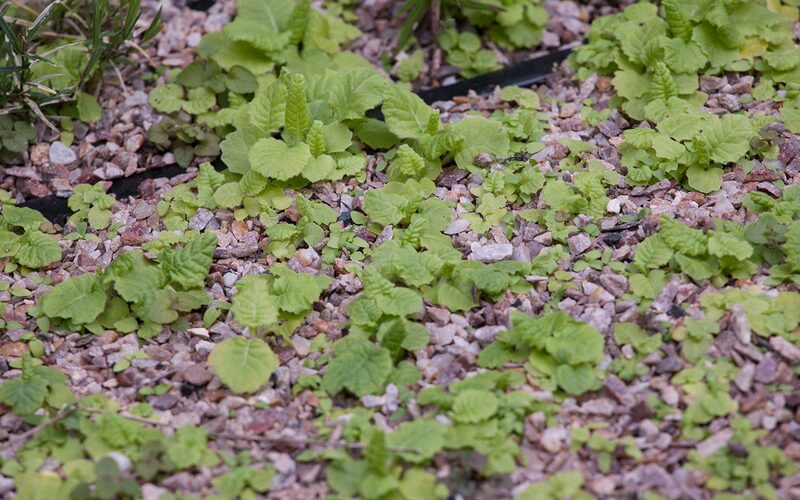 The young plants will be grown on this summer and planted out this coming autumn with the promise of winter rain to help in their establishment. I will make a point of starting a cycle of sowings so that, every year until I feel they are doing it for themselves, we are introducing them to the places they like to call their own. The sunny slopes under the hawthorns in the blossom wood and the steep banks at the back of the house where it is easy to put your nose into their rosettes and breathe in their delicate perfume. I will plant them with violets and through the snowdrops and Tenby daffodils, sure in the knowledge that, whatever the weather, they will loosen the grip of winter.